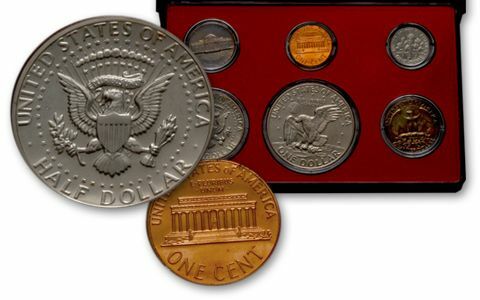 The 1973-S Proof Set was the first to contain a One Dollar coin since 1904. A Copper-Nickel Clad version of the Eisenhower Dollar was included in the 1973-S Proof Set, adding $1.00 to the face value and justifying (in the Treasury's mind) an increase in the sales price. Sales fell slightly from 1972, but the mintage of 1973-S Proof Sets was still a respectable 2.76 million. 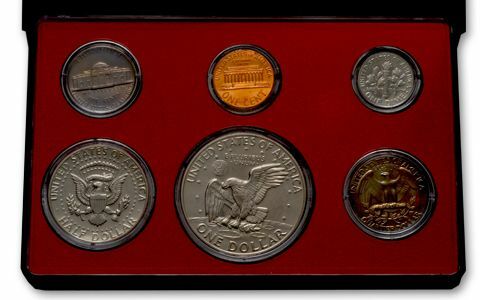 Each set contained six coins: One example each of the Lincoln Cent, Jefferson Nickel, Roosevelt Dime, Quarter, Kennedy Half Dollar, and Eisenhower Dollar (Copper-Nickel Clad). About the sets: 1973-S Proof Coins are found with Brilliant, Cameo, and Deep Cameo surfaces. All three finishes are readily available. 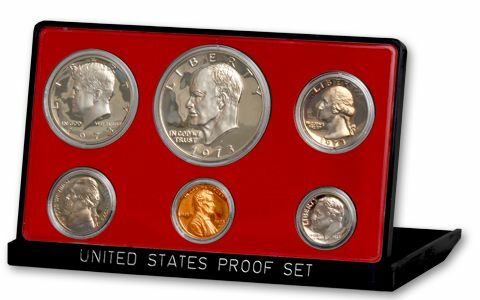 The Proof 40% Silver Clad version of the 1973-S Eisenhower Dollar was NOT included in the 1973-S Proof Set, but was sold separately in a special case and presentation box. 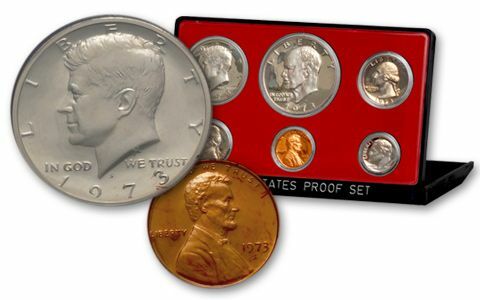 Original packaging: The individual coins of the 1973-S Proof Set were sealed in a two-piece, clear plastic case. Raised rings of plastic separated the coins from each other, and a red, felt-covered paper insert was added for visual impact. The clear plastic case containing the coins was inserted into a molded, black plastic frame with the raised silver words "UNITED STATES PROOF SET", and a hinged flap that could be flipped over for display purposes. 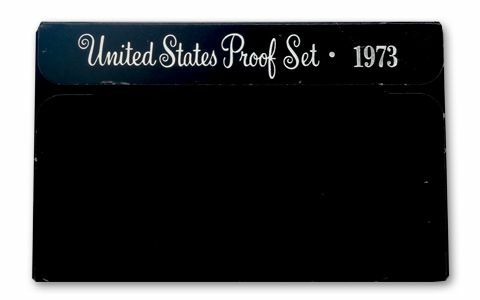 A black card cover imprinted with silver letters, "United States Proof Set • 1973" protected both the case and the frame.